On Oct. 1, USCIS began using digital tablets to administer the English reading and writing tests during naturalization interviews as part of the agency’s ongoing business modernization efforts. Although USCIS applicants already use digital tablets to sign or verify parts of their applications, this new approach expands tablet usage, allowing the device to be used for a greater portion of the application process. USCIS will be able to continue using the paper process on a case-by-case basis. While the eligibility requirements and the subject material of the naturalization test have not changed, applicants are now using a stylus on a digital tablet instead of a paper application. • For the reading test, a sentence will appear on the tablet and the ISO will ask the applicant to read it. • For the writing test, several lines will appear on the tablet, replicating the appearance of a piece of blank paper. The ISO will read a sentence aloud and ask the applicant to write it on the tablet. Applicants will continue to take the civics test verbally, without the tablet. 1. If your green card will expire within six months of filing for naturalization you must also file Form I-90 with the filing fee to renew your green card. • In order to obtain an ADIT stamp, these individuals must provide the USCIS Field Office with a Form I-90 receipt notice. 2. 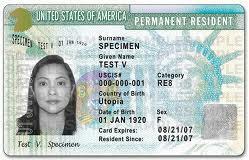 If your green card has at least 6 months of validity remaining, you are not required to renew your green card by filing Form I-90. • You may receive an ADIT stamp without presenting a Form I-90 receipt notice. • If you wish to apply for naturalization and without incurring the added expense of renewing your green card, you should file for naturalization while your green card is still valid for at least 6 months. This will save your $540. USCIS’s guidance appears to originate from 8 CFR §264.5(b)(2) which provides, “A permanent resident shall apply for a replacement Permanent Resident Card … when the existing card will be expiring within six months….” Moreover, both the September 29, 1999 INS memorandum, Form I-551 Renewal Policy and Procedure-Interim Process and the subsequent February 1, 2002 memorandum, Form I-551, Permanent Resident Card, Renewal Policy and Procedure-Final Phase; Process for I-90s, note that INA §264(e) makes it a misdemeanor offense subject to a fine of $100 and/or imprisonment for not more than thirty days for failing to carry a certificate of alien registration or alien registration receipt card at all times. The 2002 memo further notes, in reliance on 8 CFR §245.5(b)(2), that “a Form I-90 renewal application may be filed up to six months prior to the expiration of the card, or on or after the expiration date.” Thus, an LPR who files an N-400 when the I-551 is still valid for 6 months or more, and who wishes to extend their I-551 in lieu of obtaining an ADIT stamp, should refrain from filing Form I-90 until the I-551 will expire in less than 6 months. The take away from this is to file your naturalization application more than six months before your green card expires and to carry your green card. Some Additional Requirements On Green Card Holders That Do Not Apply To Citizens. Quite a few people are confused as to the differences in rights and responsibilities between U.S. citizens and Lawful Permanent Residents (LPRs). As a legal matter, LPRs, although allowed to stay and work in the United States permanently, are still ‘‘aliens’’ and subject to immigration law. Unlike United States citizens, below are some of the additional requirements on “Green Card” holders. • LPRs must apply for naturalization to obtain citizenship, demonstrating good moral character and at least five years of continuous residence under section 316 of the INA (8 U.S.C. 1427), as well as an understanding of the English language and a knowledge and understanding of the fundamentals of the history and of the principles and form of government of the United States under section 312 of the INA (8 U.S.C. 1423). If you are interested in becoming a U.S. citizen we have created a new page with a short video, please click here. Throughout our nation’s history, foreign-born men and women have come to the United States, taken the Oath of Allegiance to become naturalized citizens, and contributed greatly to their new communities and country. The Oath of Allegiance has led to American citizenship for more than 220 years. Since the first naturalization law in 1790, applicants for naturalization have taken an oath to support the Constitution of the United States. Five years later the Naturalization Act of 1795 required an applicant to declare an intention (commitment) to become a U.S. citizen before filing a Petition for Naturalization. In the declaration of intention the applicant would indicate his understanding that upon naturalization he would take an oath of allegiance to the United States and renounce (give up) any allegiance to a foreign prince, potentate, state, or sovereignty. Applicants born with a hereditary title also had to renounce their title or order of nobility. Before 1906, there were as many as 5,000 courts with naturalization jurisdiction. Each court could develop its own procedures for administering the oath. Some courts simply documented that applicants swore an oath. Other courts chose to write and print their own text for the oath, which the applicant would read at the final hearing. In 1905 a Presidential Commission on Naturalization studied naturalization in the United States. They found that U.S. naturalization courts lacked uniformity. They recommended classifying and summarizing naturalization laws into a code (re-codification), the creation of a federal agency to oversee naturalization procedures, and standard forms for all U.S. naturalizations, including a form for the oath of allegiance. The Basic Naturalization Act of 1906 implemented many of the Commission’s recommendations, but did not mandate a separate form for the oath of allegiance. Instead, the new Declaration of Intention form and Petition for Naturalization form included some of the substance of the oath. At the final hearing the applicant still recited a spoken oath adapted from the law. In 1906 the Basic Naturalization Act also added the section of the oath requiring new citizens to defend the Constitution and laws of the United States of America against all enemies, foreign and domestic; and bear true faith and allegiance to the same. I hereby declare, on oath, that I absolutely and entirely renounce and abjure all allegiance and fidelity to any foreign prince, potentate, State, or sovereignty, and particularly to __________ of who (which) I have heretofore been a subject (or citizen); that I will support and defend the Constitution and laws of the United States of America against all enemies, foreign and domestic; that I will bear true faith and allegiance to the same; and that I take this obligation freely without any mental reservation or purpose of evasion: So help me God. In acknowledgment whereof I have hereunto affixed my signature. This regulation introduced a signed oath with standardized language. There was still no separate, federal form for the oath. It was most likely printed on the back of the application form. The Immigration Act of September 23, 1950, added text to the oath of allegiance about bearing arms on behalf of the United States when required by the law; and performing noncombatant service in the armed forces of the United States when required by the law. Prior to 1946, the Supreme Court had ruled that the language in the oath about supporting and defending the Constitution and laws of the United States against all enemies implied a promise to bear arms. This was challenged in the court case of Girouard v. U.S. (328 U.S. 61). The Court ruled that the oath of allegiance did not imply a promise to bear arms. A refusal to bear arms was justified on the basis of religious training and beliefs. Under current law, an applicant opposed to bearing arms or performing noncombatant service because of his or her religious training and beliefs is exempt from taking the full oath of allegiance. The section of the oath of allegiance about performing work of national importance under civilian direction was added by the Immigration and Nationality Act of 1952 and is the last major addition to the oath of allegiance as it appears today. Voting before citizenship makes you deportable. In a precedent decision issued yesterday, the BIA held that a respondent who has voted in an election involving candidates for federal office in violation of 18 USC §611(a) is removable under section 237(a)(6)(A) of the INA, regardless of whether the respondent knew that he or she was committing an unlawful act by voting. The BIA reasoned that because the respondent, an LPR who had disclosed during a naturalization interview that she had voted in an election in 2006 that included a local school board race, had intentionally voted in an election involving candidates for federal office, the general intent requirement of §611(a) was satisfied. This sad case is one example of how someone’s life was ruined because they were unaware they were violating the law. U.S. immigration law is very complicated. Please make sure you understand the effect of what you have done and what you are signing before you send in any immigration forms. Our office represents clients before USCIS, the U.S. Consulates, Immigration and Federal Courts. If you would like to schedule an appointment to discuss your case will me, please call my office or you can schedule an appointment online by clicking here.